American medicine at its finest. Good for you! Good for the son! Outrageous!! I recently admitted a 91 yo lady for dehydration and generalized weakness and acute renal failure. Had a horrific carotid bruit on exam. When i discussed the lady with her son, i mentioned she probably had a left carotid blockage but at her age and condition i won't even be ordering an ultrasound of it because it doesn't matter. No symptoms and NO SURGERY! He was fine with it. Just communicate! And we wonder why the government wants to get more involved in health care. Physicians will have noone to blame but themselves when the screws are tightened. I can't wait to begin payment on my 225 thousand dollar medical school debt. By the time I'm through training, we'll all be making peanuts because of this type of awful decision-making and greed. Thanks. Of course if we stopped doing crazy s%$t like this we wouldn't need any more taxes to pay for our ridiculous health care system. I must have missed something. "Affable enough," and oriented to place, no mention of disorientation at all, no mention of dementia. Why aren't conversations being had with the old guy himself, instead of around and about him? It sounds like the right decision was made by the son -- I am so glad he stepped up. People are quick to balme the greedy physicians. But how about the family who wants everything done for Mom, no matter what. If you don't do everything, the will find a lawyer who will be happy to sue you for deviating from the standard of care. I bet they found pancreatic cancer, didn't they? Free =/= more, Happy. You should know better. Canadian and British healthcare are nothing like free, though there is no immediate cost to the patient. You get your crazy abusers of the system, but where don't you? Who on earth wants "more" medicine, really? If you say everyone, boy have you got a skewed view. "Free" = available to all = far lower maternal and infant mortality = more longevity = better outcomes. How much do you estimate that 24 hours between your visits cost . . . someone? NJ is famous for doing tests on patients even when it is obvious they have like a week to live. Shameful, Palliative care should occur the minute you enter a hospital. For a car accident or cancer. Having people around to help ease pain no matter what, be it morphine or massage. None of this, oh yeah, let us stick another tube in there to make sure you really have an issue. Good for you and good for the son indeed! Red Rabbit: Yup. In fact, we already HAVE rationing here in America. It's called "being turned down by your insurance company". When I was first diagnosed with uterine fibroids back in 2002, I wanted to have them treated with uterine artery embolization. However, BCBS -- the alleged gold standard for health insurance -- wouldn't cover it as it was "experimental". Never mind that a) not one part of the UAE equipment or procedure was anything that hadn't been used in US hospitals for decades beforehand, and b) French hospitals had been doing UAE for twenty years. By the time BCBS got around to covering SOME (not all) UAE treatments, my fibroids were too big for UAE. Amazing. And good for you. In my experience, for reasons I can't explain, it's more likely to be a surgeon who is, as were you, the voice of reason in such situations. I wish I had more docs willing to say what you were saying on this chart. I have to fight too many of the aggressive dogs. Have to remind them about these things called non-beneficial treatments, open communication lines and patient autonomy. And same goes for the family who wants to do "everything to/for" Mom. Patients have the right to refuse treatments but not the right to demand non-beneficial ones. To the anonymous poster who worried about families suing you: believe it or not most families are rational and given a few moments of your time to explain the situation, the limitations of treatment, and the poor prognosis, along with the recommendation of hospice as best medical care for the patient in this example, they usually will make the right decision. studies have demonstrated that the most common reason families/patients sue doctors is because they feel that the doctors did not take the time to talk to them. it's important for docs to have basic communication skills and in the long run, a few minutes of your time up front will hopefully save hours and possibly weeks and months of headaches later on. Thank you for your compassion, your insight and your courage. We need more folks like you. It's remarkable that there had apparently been no advance care planning for this patient. Had there been, even the contemplated over-medicalization might not have been ordered. 1) The gentleman stated that he had been bothered by abdominal pain for "months." You do not mention any communication with his PCP. History? Was he diagnosable and treatable when he first began complaining of symptoms? 2) Please tell me that it was the gentleman's prognosis, not his age, at issue here. What if he had been 57 years old and disabled? 32 years old and working? An elderly U.S. Senator with glioblastoma? Personally, I would decline any invasive testing or treatment other than palliation for myself. However, I am uneasy with the gray area of palliation >rationing >euthanasia. As a physically "disabled", chronically ill individual with superb cognition, I have had to fight to remain labeled "salvageable" to receive even the most basic treatment. I see elderly individuals with limited resources essentially abandoned by a Medicare - Medicaid rationing system. Certainly, it is cheaper for the taxpayers if we have the good manners to just go away and die. But I worked and paid taxes my entire life and I fully intend to utilize those (necessary) services within reason until the quality of my life makes palliation the correct option. I don't ask for any more than the taxpayers provide to Senator Kennedy. I had a similar case involving a man in his seventies with an unresectable lung tumor. The patient was asymptomatic except for a slight cough. He and I both thought a few extra months wouldn't be worth the chemo effort. Well, the family would have none of that advice and made it clear to me, and everyone in the waiting room, that their father was never going to see me again. With the ensuing workup the oncologists found an abdominal aneurysm that they wanted fixed prior to the chemo. The patient spent the next few weeks dealing with the surgery and then died after the first round of chemo two months after I first saw him. I know this anecdote leaves out details...but it is one reason I'm glad I retired early. I sleep much better. Excellent point. We need mandatory documentation of what individuals preferences/goals are with respect to end of life decision making. Too often, patients end up intubated/sedated in some ICU before those questions are ever asked. Age is irrelevant in the case. 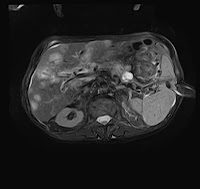 The man had unresectable metastatic pancreatic CA. Just found my way to this blog via Pauline Chen's "Medicine in the Age of Twitter" article on nytimes.com. I'm happy to see that good medicine requires common sense and communication. As a 30-something applying to med school, I believe I have more of both than I did at 22. I hope to become a physician of your caliber, Dr. Parks. Keep up the excellent work. after just leaving my grandmothers funeral yest I feel I can rant a little...She had a massive stroke last week. Left her completely comatose. I was mortified to come home to find daily labs, xrays daily, and orthopedic surgeons discussing how to fix her broken hip...not to mention the GI doctor that was more than willing to put a feeding tube in her...and of course she was "comfort care"!?!? I lashed at the doctors for their unprofessionalism. I told them how disgusted I was in their ethics. The next 2 days she passed peacefully. I wonder if I was not a physician what would have happened to her????? As a Palliative care physician,this scenario is played out on a daily basis,and I applaud your intervention even though a little late. Honest communication with our patients,shared in an Empathetic manner,and a commitment of Non-abandonment till the very end will vastly improve care /compassion of the terminally ill patient. American medicine is too good. Very Good job.